Daredevil High-Wired For Success Over Niagara Falls Nik Wallenda is the first person to walk directly over the falls. Thousands gathered to watch him inch along a tightrope Friday night. Though the wire was dripping from the mist, Wallenda accomplished a dream he'd had since childhood. Nik Wallenda crosses over Niagara Falls on a tightrope on Friday. He became the first person to cross directly over the falls from the U.S. into Canada. Wallenda is part of the famous "Flying Wallendas" circus family. Over seven generations, they've pulled off daring stunts all over the world. 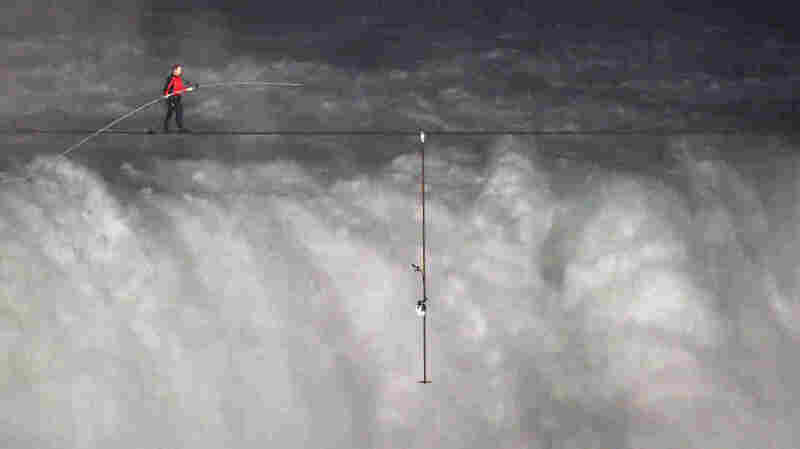 But Wallenda told reporters walking an 1,800-foot cable over Niagara Falls tops them all. He's wanted to do it since his first visit to the falls as a 6-year-old. "That was when the vision came to me to walk across Niagara Falls," he said. "Of course, I didn't know the history at that point that no one had ever walked directly over Niagara Falls, but we're about to change that." Officials in Niagara Falls, N.Y., had a lot of hope riding on the event. They wanted it to spark a return to the city's glory days, when crowds flocked to see daredevils while enjoying a carnival-like atmosphere. Before Wallenda's walk, performers lined the streets downtown. Acrobat Ashley Vita Verde stood by a sign reading, "Wallenda's Side Show." Among the entertainers were contortionists, fire performers and clowns. As it got dark Friday, thousands jockeyed to secure a spot near the tightrope. Ernest Groening came all the way from Switzerland. After watching the Niagara River crash over the falls on the rocks below, Groening was worried for Wallenda's safety. "For my part, I think it's crazy," he said, "but people like to do crazy things." Around 10:15 p.m. ET, Wallenda stepped on his 2-inch-thick cable that was dripping wet from the mist. He wore a waterproof jumpsuit, elk skin shoes his mother made and a safety harness. Onlooker Gary Neal was disappointed. "I reckon I could do it myself with a safety harness," he laughed. "That takes the excitement away for me." The tether was the result of a last-minute negotiation with ABC, which sponsored the event. Moving slowly, Wallenda carried a 40-pound pole to help him balance. People watching the ABC exclusive "High-Wire Over Niagara Falls" could hear him praying and describing his fatigue. "I'm strained. I'm drained. This is so physical. Fighting that wind isn't easy. My hands actually at this point feel like they're going numb," he said. Back on the ground, Cody Cliveeter tried to peer through the mist to cheer Wallenda on. "It takes a lot of talent, and he's sure got it. I can't believe it. I cannot believe what I'm watching," he said. As Wallenda approached Canada, he sprinted the last few feet of the wire and then presented his passport to customs officials. Linda Marshall lingered around, reliving the moment. "He made it look too easy! You kind of wanted to see a little wobble or something to make it seem riskier than it was," she said. 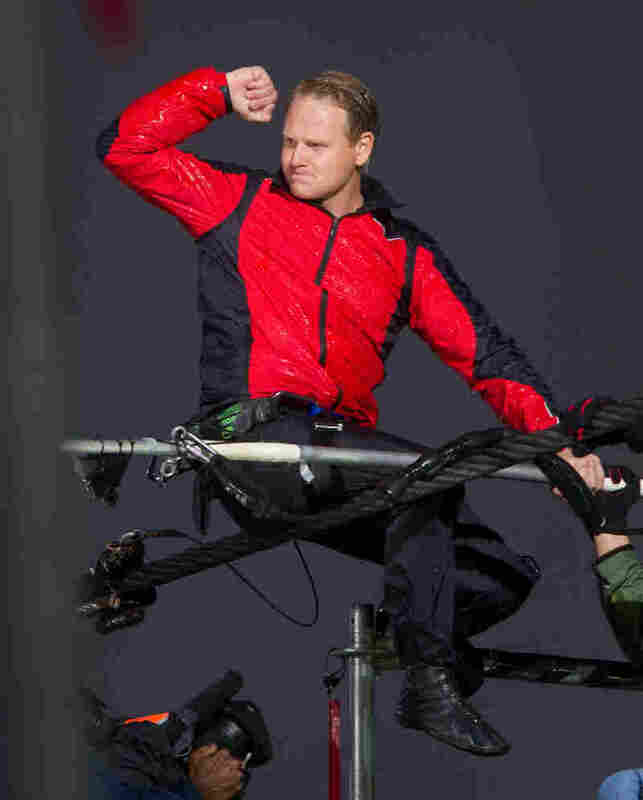 After years of planning, Wallenda says he's happy to join the ranks of famous Niagara Falls daredevils. "It's as real as it gets now, isn't it? There's no turning back. It's done. It's official. It's in the history books," he said. But Wallenda says he's not done making history yet. He's already secured permits to become the first person to walk a tightrope across the Grand Canyon.